Ben Burnley, lead singer of Breaking Benjamin, is sitting in his tour bus on a Friday afternoon during an unseasonably cloudy day in Orlando, Florida. As he answers questions, he’s watching small lizards run around outside the window. The day before we spoke, the sad news of Prince’s death had resounded across the internet. Burnley said that while he wasn’t the biggest of fans, the news was incredibly sad. He said it reminded him of being in the studio working on “Dear Agony” when Michael Jackson died. Those words seemed prescient as more details came out about Prince’s death. For Burnley, though, the death of Prince didn’t have nearly the impact as the death of some other legends. But Burnley said Freddie Mercury and Kurt Cobain had the greatest impacts on him, both personally and musically. He said he feels like he’s a part of the “offshoot” generation that wasn’t really counted. Influenced by bands like Nirvana, Korn and Tool, but too late to be considered a part of that era. When he was a teenager, Burnley said, he dressed like Cobain, he learned all of his songs, trying to sing and play just like him. And that was where he really started to get into music more. Though in a rather roundabout way. “There was a big cover scene happening in Northeastern Pennsylvania, where a cover band could make a lot of money playing on the weekdays and on the weekends,” he said. Burnley said that’s how the first incarnation of Breaking Benjamin got started, just playing cover songs in local clubs. As they got more popular, Burnley started adding some of their original songs to the sets. He said people would come up after sets to tell him they really liked “that one song” but they didn’t know who it was. 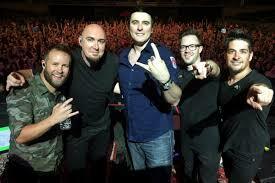 There have been a couple different lineups of Breaking Benjamin over the years, but the biggest change took place in 2011, when Burnley fired the rest of the band. As the primary songwriter, he was able to do that without really being afraid of what might happen. He said he would guess we wrote “about 95 percent” of the music, so he knew the sound wouldn’t be different, because the writing process didn’t change. Clearly, the effect hasn’t been too negative, considering their new album, “Dark Before Dawn,” is almost gold. As far as touring goes, Burnley said they’ve been having a great time, even adding dates as they go. “With the old members, it wasn’t an enjoyable experience for me,” he said. “I don’t really care if people disagree with things I say, and every time I talk about the old members, there’s always someone who disagrees with what I’m saying,” he said.